US Cellular is one of the more popular among our Wireless Noise subjects, and we were reminded after our article on Verizon's lack of a viable value-oriented wireless choice, that US Cellular has even less. US Cellular has not been competitive with their Prepaid product, possibly because they can't offer as much coverage as larger carriers. We think they can, and more importantly, they should. Like Verizon, US Cellular's best competitor should be themselves. US Cellular has an advantage with their less-restrictive ownership. They can be much more creative in their combinations of their own network bundled with roaming partners. They even cut a deal with Google Fi, a potential competitor. US Cellular continues to expand their network, they recently purchased some new 600 MHz spectrum. They also need to take a broader view for their customers who want to save a few bucks, without leaving open the barn door. Hey, US Cellular could buy US Mobile to give them a bargain outlet. but we hear Virgin Mobile might be available...or at least not being used. Now that Verizon has reported a first-ever net loss of wireless customers, we want to check on their backup plan. Oh...we don't see one. Let's look at the competition. AT&T has both a Cricket and a GoPhone. T-Mobile has MetroPCS. Even Sprint has a Boost and a Virgin. Each of the other "Top 4" have a prepaid version for value-oriented customers to fall back on, where Verizon claimed their Prepaid was TracFone. We thought that was short-sighted. Now it's blind-sided. Verizon is losing wireless customers to the competition when they could have been losing customers to themselves. They tried to revive their own prepaid brand, but it's too little, too late. Are they afraid they might dilute their product? We don't think they should be baking up a "Verizon Lite," but they do need a Plan B. Last week Verizon announced a deal to lay more fiber. Now it looks like before they add more fiber to their diet, they need to unblock their wireless pipeline. Fortunately, Verizon is moving in the right direction by expanding their network bandwidth and swimming into the 5G depth of the pool, but don't lose those of us at the other end of the pipe. OK, it's a good thing they threw us an Unlimited bone, but figures say we want more. Let's hope TracFone doesn't really become Verizon's prepaid division, they're one of the disruptors stirring these wireless waters. It was little over a year ago we noted that T-Mobile had overcome our biggest objection to sign up as T-Mobile customers. They had purchased a large chunk of 700 MHz spectrum, and had actually built cell sites using those frequencies giving them more, and better, coverage than ever. Now that they have purchased another large swath of spectrum in the new 600MHz band, we would expect them to pretty much cover the entire US (yes, Alaska and Hawaii as well) as well as...or, egad, better, than other carriers. We don't usually give credit to carriers for new coverage until it actually happens and in this case we will add our usual dose of caution: we won't be using this new spectrum until we can get 600 MHz-capable phones. They're coming, and T-Mobile claims they'll start using their newly-acquired space later this year. Yes, this is possible, but to fully use this new spectrum, a few hundred TV stations have to move their on-air TV channels, which could take years. 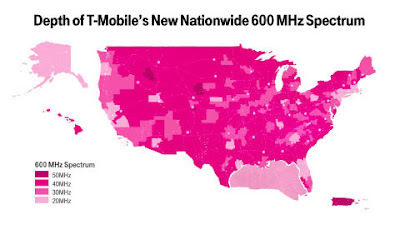 Also, 600 MHz isn't the best wireless coverage band, but it fits well into T-Mobile's spectrum portfolio even though it doesn't address those elusive "5G" needs. The part we like the most is what happened in several areas with their 700 MHz bands: coverage in rural America. The next thing we have to endure are all the stories that will state that now T-Mobile becomes an even better takeover candidate, or merger partner with Sprint. Aw, c'mon. That honor belongs to Dish and Comcast, the other big 600 MHz auction winners.